The ForEva straws were discovered while I was on vacation in Bali. I knew that this business was going to work when my experience was too coincidental, and it seemed to be a sign from my late grandmother, choosing the name ForEva Straws. You see, it is a ForEVA Straw and not Forever Straws. My late grandmother’s name was Eva Johnson and she raised me from birth. She was my best friend, my sister, my pillar of strength, my everything. On the 13th of January 2017, I was in Bali on vacation with a good friend Valissa. I had, what is known as ‘The Bali Belly’. At dinner, on this evening I played it safe and ordered a soft drink (which, to date, was the best decision of my life). My drink arrived on the table with this beautiful piece of stainless steel. This can only be described as my ‘Uh Huh Moment’. Never in my life had I ever seen a stainless-steel drinking straw. I could not believe my eyes, I could not understand why we were not using these gorgeous straws back home in South Africa. My mind was made up that very moment, SA was in need of these. And I was bringing them home. I got back home, did research, sourced the straws, trademarked the name, registered a company, set up a website and got ready for our launch at the Coffee & Chocolate Expo Monte Casino 2017, which happened to fall on my late grandmothers’ birthday the 18th July. A true celebration was in order. Prior to the discovery, I was unaware of this global crisis and the damage that single-use plastic is doing to our planet. Honestly, I used plastic straws and other plastic items almost every day. After the discovery the use of plastic straws by myself, my family and my friends has become an absolute no. Using reusable products is becoming a lifestyle now, this journey has changed my life. I am not perfect, but I am getting there, one straw at a time, one bag at a time, one cup at a time. Every little bit counts. As we move into fully comprehending the damage that single-use plastic does; just imagine every person on the planet using a stainless steel or alternative straw as opposed to single-use plastic… the volumes are quite scary. To date, we are in over 100 stores nationwide and 5 internationally. Our vision is to eliminate all single-use plastic straws. And this is the difference we want to make, even if it is just a little one. In 2018 we launched The ForEva Foundation, which is a ‘Give Back’ initiative where a portion of our profits goes towards making a difference through education, a female empowerment program and other upliftment initiatives. We also work very closely with Miss Earth South Africa on various give-back projects and on educating our youth about sustainable living, the many alternatives to single-use plastic, as well as how to recycle and get creative with plastic. I am honoured and blessed to be able to run a business that provides a sustainable product that contributes to saving our planet, and in the same breath creating a legacy for my grandmother. As is with any “trend”, people tend to leverage a need in order to make a profit, and so are getting into the straw business for the sake of making a profit. ForEva Straws are here to make a difference, to change lives, to change mindsets, to educate, to develop and to contribute. 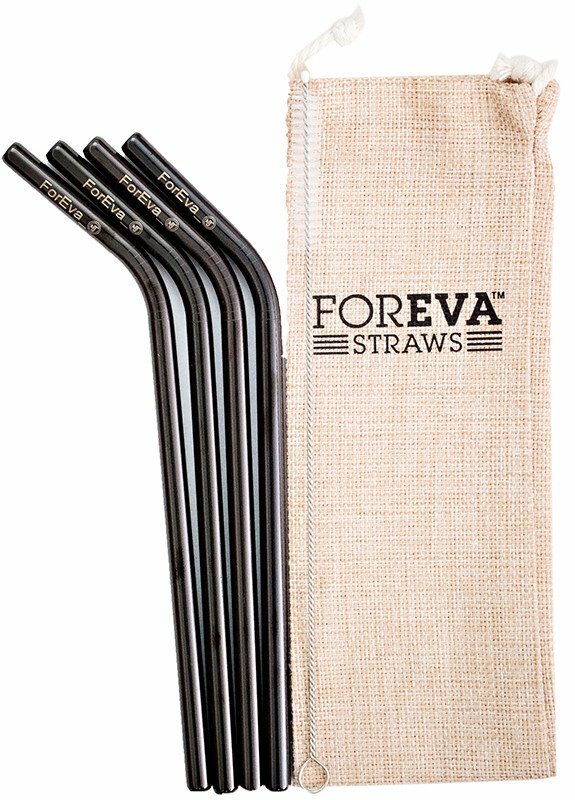 Get your very own ForEva straws through Faithful To Nature.